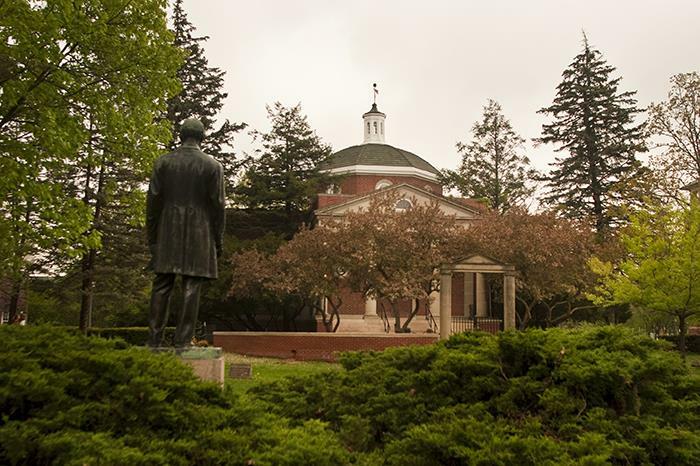 For the second consecutive year, Truman has earned the distinction of being named the best “hidden gem” in the state of Missouri. 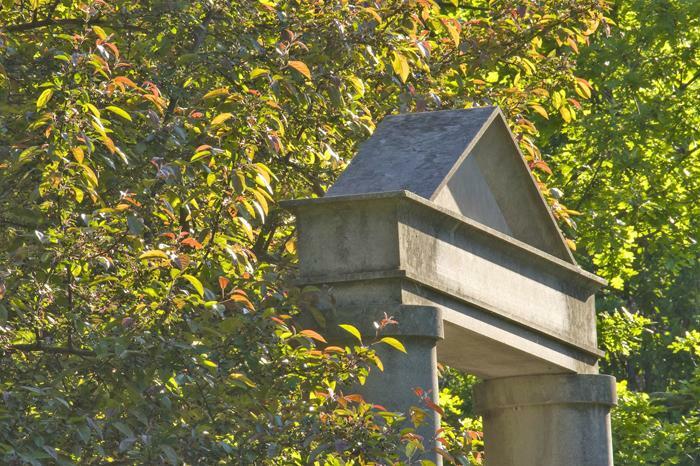 College Raptor Inc., a college matching platform, recently released its second-annual list of hidden gem schools for each state. In order to qualify, institutions must have received fewer than 5,000 applications in the previous application cycle for which data is available and enroll at least 1,000 undergraduate students. From this set, the top-ranked college, nationally, was selected from each state. For more information on the hidden gems rankings, click here. Alex Tetlak was named the Educator of the Year and Vayujeet Gokhale earned Research Mentor of the Year honors during the annual Accolades of Academics banquet in April. These awards seek to honor outstanding faculty at Truman who have devoted extraordinary effort to invest in their students. Tetlak is an instructor in classics. He was nominated by Bailey Jarman, Wyatt Mansell and Taylor Burgert. Other nominated faculty members include Jeff Gall, Diane Janick-Buckner, Curran Prendergast, Robert Tigner and Alicia Wodika. Gokhale is a professor of physics and was nominated for the award by Tyler Gardner. Other nominees include Michael Bird, Michelle Boyd, Paula Cochran, Nancy Daley-Moore and Jennifer Hurst. Faculty members honored at the Accolades of Academics banquet were all nominated by students and were awarded by a student-driven committee. Members from Student Government, the Pershing Society and Phi Kappa Phi serve on the Educator of the Year committee. Students have the opportunity to nominate instructors for these awards each year at senate.truman.edu. 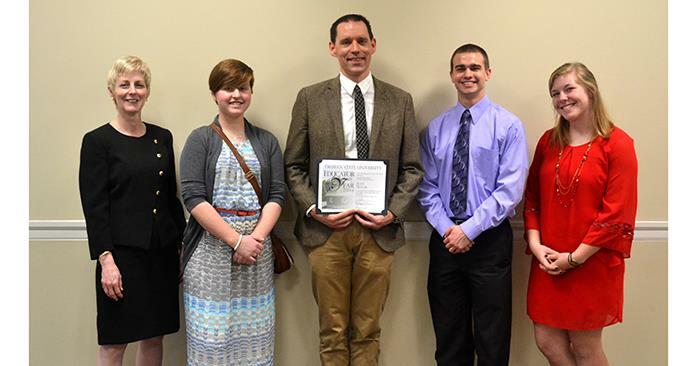 Alex Tetlak poses with the students who nominated him for the Educator of the Year award. Pictured, from left, Sue Thomas, executive vice president for academic affairs and provost, Bailey Jarman, Tetlak, Wyatt Mansell and Taylor Burgert. 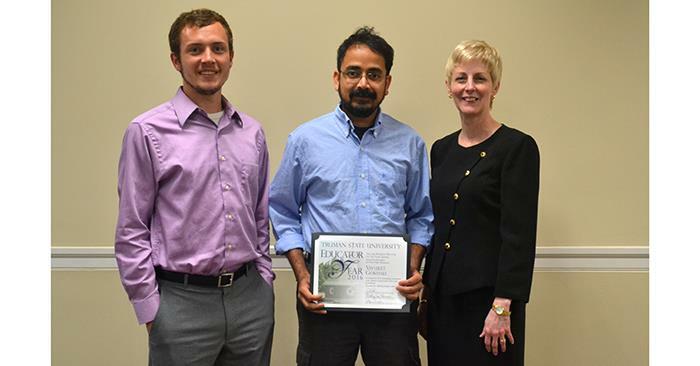 Vayujeet Gokhale (center) takes a picture with Tyler Gardner and Sue Thomas. Gokhale received the Research Mentor of the Year award after being nominated by Gardner. Two teams of Truman students received first and second place in the Robert L. Gould Scholastic Award, earning a combined $17,500. The Gould Scholastic Award recognizes outstanding students who write papers on designated topics related to the financial services industry. This year, submitted papers were expected to address the potential impact of technology and innovation on the financial services industry and its services models during the next 10 years. Students from Avila University, the University of Kansas, Park University, Saint Louis University, Truman State University, the University of Missouri – Kansas City, Northwest Missouri State University, the University of Central Missouri, Baker University and Kansas State University were eligible to compete. Winners were selected based on the evaluations of representatives of DST, a global provider of specialized technology, strategic advisory and operations outsourcing to the financial and health care industries. Truman students who took first and second place in the Robert L. Gould Scholastic Award display their certificates of recognition. 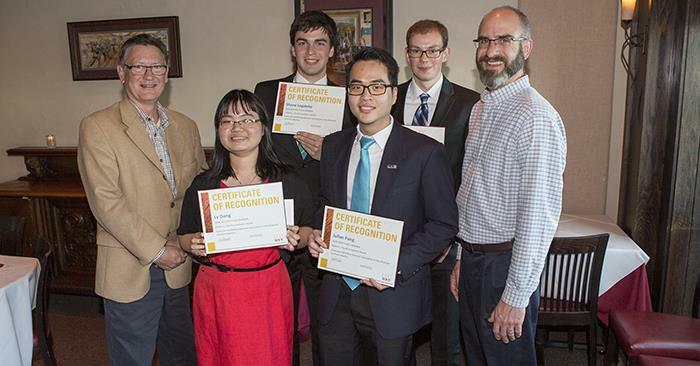 Pictured, from left: Chuck Boughton, faculty mentor, Ly Dong, Shane Legatzke, Julian Fung, Lasse Fuss and Matt Gould, son of the award’s namesake. Margaret Wilcox and Luke Bishop have both been selected to receive the U.S. Department of State Critical Language Scholarship for summer 2016. The CLS program is part of a U.S. government effort to expand dramatically the number of Americans studying and mastering critical foreign languages. These exchange programs are designed to build relations and respect between the people of the United States and the people of other countries. Wilcox will study Swahili in Arusha, Tanzania. Bishop will study Azerbaijani in Baku, Azerbaijan. Approximately 560 undergraduate and graduate students received the CLS for 2016. Selected finalists fail from 48 states and the District of Columbia, and represent more than 200 institutes of higher education. Each CLS participant will spend eight to 10 weeks in one of 24 locations studying Arabic, Azerbaijani, Bangla, Chinese, Hindi, Korean, Indonesian, Japanese, Persian, Punjabi, Russian, Swahili, Turkish or Urdu. CLS participants are expected to continue their language study beyond the scholarship and apply their critical language skills in their future professional careers. 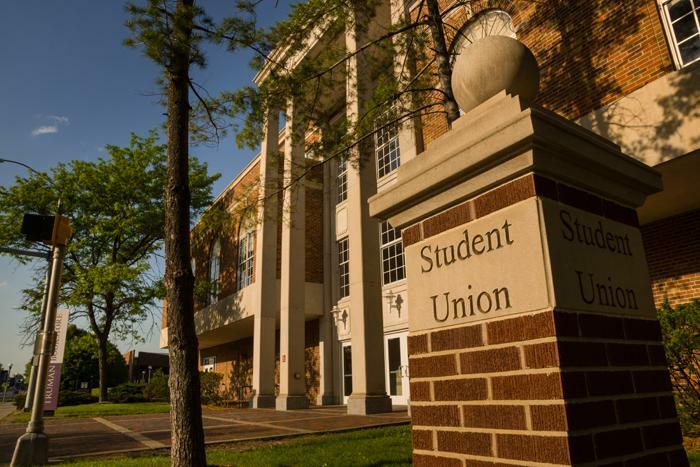 The Board of Governors will host a reception from 3-5 p.m. June 11 in the Student Union Building Hub in honor of Troy and Kelly Paino for their service as President and First Lady of Truman. 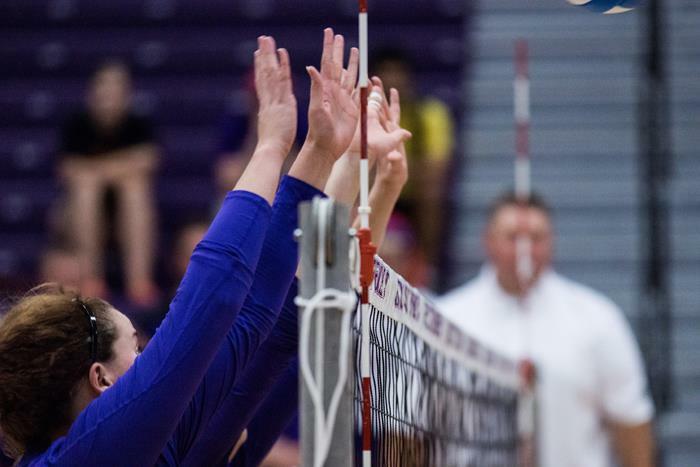 The Truman volleyball program will conduct an All-Skills Clinic for players entering grades 4-12 from 9 a.m.-11 a.m. May 24, 25 and 26 in Pershing Arena. Head coach Ben Briney and assistant coach Megan Wargo-Kearney will instruct players on all fundamental skills with lots of individual feedback. The cost is $20 per individual session or $50 for all three days. For additional information or to sign up, fill out and print the form and/or email Wargo-Kearney to confirm attendance and bring form and payment on the day of the clinic. 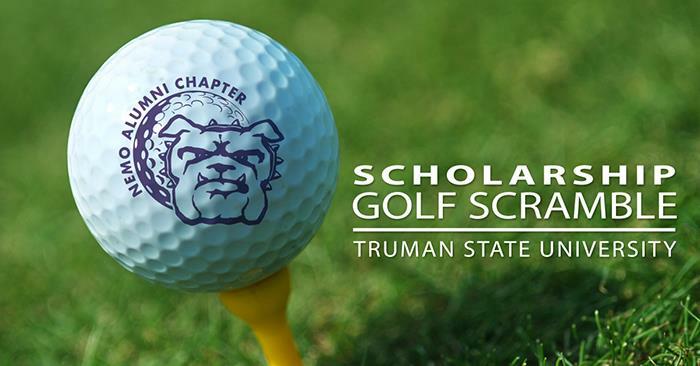 Truman alumni, family, friends and golf enthusiasts are invited to play in the Northeast Missouri Alumni Chapter Scholarship Golf Scramble. The tournament helps to fund the Northeast Missouri Alumni Chapter Scholarship, awarded to students from northeast Missouri. In addition, the Northeast Missouri Alumni Chapter will be awarding $50 Kirksville Country Club gift cards to first place in each flight and $25 Kirksville Country Club gift cards for second place in each flight. There will also be a lot of great door prizes, as well as prizes to the winners of the various contests. *You do not have to play in the scramble to participate in the contests. Tournament registration is $65 per golfer, or $260 for a team. Golf registration includes: green fees, lunch and gift bags. Carts can be reserved for $32, but there is a limited supply. The Northeast Missouri Alumni Chapter will be awarding door prizes, attendance prizes and congratulatory prizes to the winners of the various contests and scramble. There is limited space for registration on the day of the tournament. 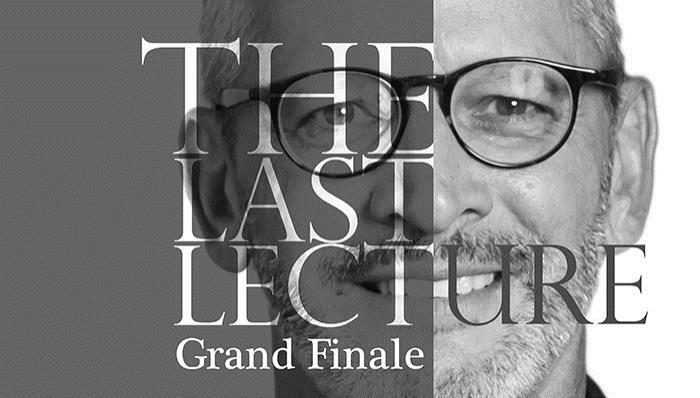 To guarantee a space, cart and lunch, please pre-register by June 3. Don’t have a team of four? We will make it work! Singles and doubles are encouraged to enter. Must be 18 or older to golf. For more information, contact the Office of Advancement at 660.785.4133. To make an appointment, visit redcrossblood.org. The Truman men’s basketball team will offer three summer camp options for various age groups of boys this summer. Each player will develop his skills through drill work, contests and games while also receiving instruction and interaction with current Bulldog players and coaching staff. Campers will receive a camp T-Shirt as well. Cost will be $85 per camper with siblings receiving a discount of $10 off per camper. This camp will focus on developing and improving fundamentals through extensive drills and competitive games. The $50 cost per camper will include a T-Shirt and dinner. There are multiple discounts available to siblings and teammates. Teams will play at least three games with the cost being $150 per team. 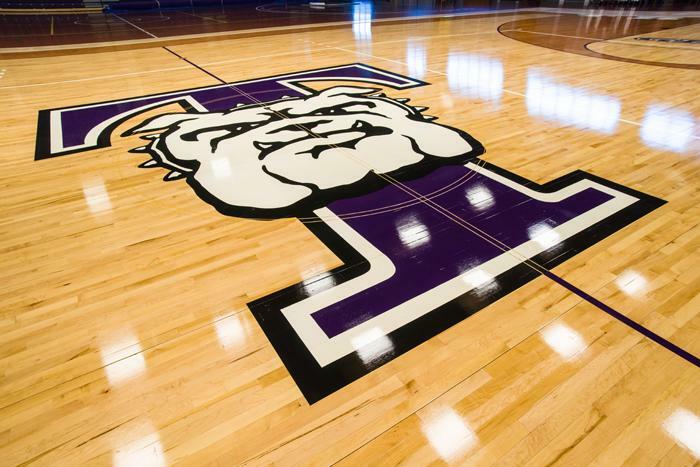 To sign up, fill out the form associated with the desired camp and mail it in or visit TrumanStateBasketball.com for online registration. For any questions, contact assistant coach Mike Annese at 303.594.3336 or mannese@truman.edu. Truman, in partnership with Hosei University in Tokyo, Japan, is now accepting applications for the September 2016 enrollment for the student exchange program. Research fields for the master’s program include computer and information sciences, applied chemistry, frontier bioscience, global business analysis/planning, medical/health care systems and more. Doctoral programs are also available. Courses are taught in English. For more information and to apply, contact the Study Abroad Office in Baldwin Hall 118 or at 660.785.4076. The Department of Public Safety will have different hours during the May interim. In case of emergencies, call 9-1-1. For non-emergencies contact the Office of Citizenship and Community Standards at 660.665.5621. The next issue for the Truman Today will be available May 31. Derek Benjamin, president of Truman’s Rho Rho Chapter of Sigma Delta Pi, the National Collegiate Hispanic Honor Society, received the prestigious Gabriela Mistral Award for his academic achievements and noteworthy leadership and initiative in his chapter. The Gabriela Mistral Award is granted by Sigma Delta Pi’s national executive committee and may be presented to only one person per chapter yearly. The honor is reserved for outstanding graduate or undergraduate students of Spanish who are active members of Sigma Delta Pi. Xiaofen Chen, professor of economics, has been selected to receive funding from the Asian Development Bank Institute (ADBI) to participate in their “Workshop on Urbanization and Infrastructure in Asia,” taking place in Beijing in June, for her research paper on the consumption of migrant households. The ADBI is the think tank of the Asian Development Bank, a multilateral organization with 67 member economies. Huping Ling, professor of history, was quoted in “Here’s why Chicago’s Chinatown is booming, even as others across the U.S. fade,” published by the Chicago Tribune, May 13.